Monet, S.j., Jacques. "Georges Vanier". The Canadian Encyclopedia, 04 May 2018, Historica Canada. https://www.thecanadianencyclopedia.ca/en/article/georges-phileas-vanier. Accessed 20 April 2019. 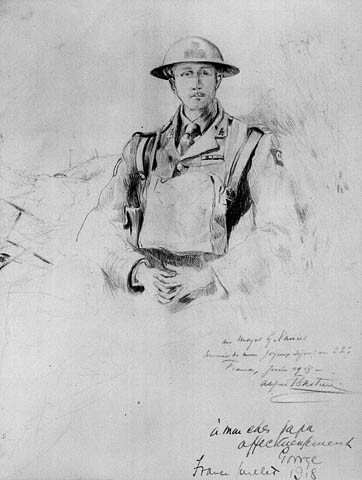 Major Georges Vanier, photographed here in the uniform of the 22nd Battalion (Van Doos) during the First World War. Vanier would become governor-general in 1959. 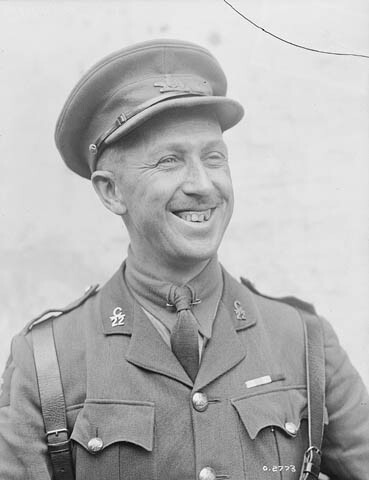 Georges Vanier was born in Montreal on 23 April 1888 to Philias and Margaret (Maloney) Vanier. After attending local schools, Georges was educated at Montreal’s Loyola College (now Concordia University). A committed Roman Catholic, he graduated in 1906 with a bachelor of arts in church devotional fellowship and began a lifelong habit of daily communion. He was the valedictorian at his graduation and won the university’s gold medal for general proficiency in philosophy. 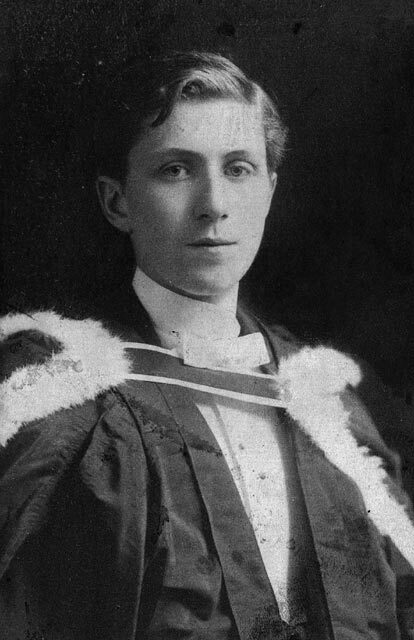 In 1911, Vanier obtained a law degree from Université Laval, and became a member of the Quebec legal bar the same year. Georges Vanier, the future governor general, at the Université Laval in 1906. Vanier served with distinction in the war. He fought at the Battle of St. Eloi Craters in 1916 and at Vimy Ridge, where he wrote to his mother after the victory in April, 1917: “You know of course that things are going with a tremendous swing and that we are pursuing the Boche (the Germans). The morale of our troops is magnificent. We cannot lose — what is more we are winning quickly and the war will be over within six months.” Vanier’s prediction was wildly optimistic. The war would continue for more than another year. On 28 August 1918 — during the Hundred Days campaign in which the Canadian Corps helped spearhead a series of battles that finally brought the war to an end — Vanier lost his right leg to an exploding German shell, near the village of Chérisy, France. After convalescing, he refused to return home. “I simply cannot go back to Canada,” he insisted, “while my comrades are still in the trenches in France.” For his courage and leadership in the war, Vanier won the Military Cross and the Distinguished Service Order. 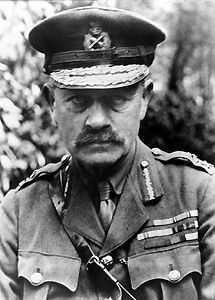 After the war, Vanier entered the diplomatic service in 1921, as aide-de-camp to Governor General Julian Byng (the British general who had commanded the Canadian Corps at Vimy Ridge). That same year Vanier married Pauline Archer. The couple would have five children, one of whom, Jean Vanier, would go on to found L’Arche, an international movement of communities for people with developmental disabilities. In 1928, Georges was named a member of Canada's military delegation for disarmament, to the League of Nations in London. Three years later, his diplomatic abilities won him a posting to the Canadian High Commission in London, where he served on staff until 1938. 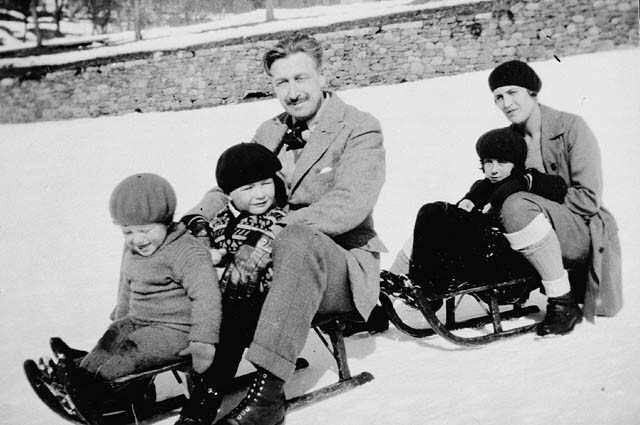 Georges and Pauline Vanier, with three of their five children, on sleighs in Ottawa, 1930. In 1939, with Europe again on the brink of war, Vanier was appointed Canadian minister to France. When the Germans marched into Paris in 1940, the Vaniers made a dramatic escape to London by car — but not before also arranging the evacuation of Canadian citizens and many refugees seeking escape to England. Back in Canada during the early years of the Second World War, Vanier urged the Canadian government to accept Jewish and other refugees fleeing the Nazis. In 1940, he wrote to Prime Minister William Lyon Mackenzie King, saying that “Canada has a wonderful opportunity to be generous and yet profit by accepting some of these people.” His effort to have Ottawa ease Canada’s restrictive refugee policy was generally met with indifference and hostility. In 1942 Vanier was promoted to major general. The following year he was sent back to London, as Canadian minister to all Allied governments in exile there. In 1944 he became ambassador to France — the first ambassador to enter the country after its liberation from German occupation. In April 1945, Vanier joined a group of American congressmen touring the infamous Buchenwald concentration camp in Germany, just one week after its liberation. Shocked by what he saw, Vanier told CBC Radio: “How deaf we were then, to cruelty and the cries of pain which came to our ears, grim forerunners of the mass torture and murders which were to follow.” The Vaniers continued to urge Canada to adopt a more humane immigration policy to accept “displaced persons” from Europe after the war. The Canadian government gradually liberalized its regulations, and between 1947 and 1953, more than 186,000 European refugees settled in Canada. Vanier retired from diplomatic life in 1953. He became a director of a number of corporations including the Bank of Montreal and the Standard Life Assurance Company, and served on the Canada Council for the Arts. In 1959, he accepted Prime Minister John Diefenbaker's offer to serve as Canada's first French-Canadian governor general. News of the appointment came at a meeting of the federal Cabinet in Halifax at which Queen Elizabeth II presided. Vanier brought his lifelong religious devotion to Rideau Hall, where he converted a small upstairs bedroom into a simple chapel where he would pray twice daily. He also asked that bilingual signs be installed at the main gates of Rideau Hall. And in speeches as governor general, he frequently emphasized how Canadian unity would help anglophones and francophones live together peacefully. In 1965 he officially inaugurated Canada’s new national flag. 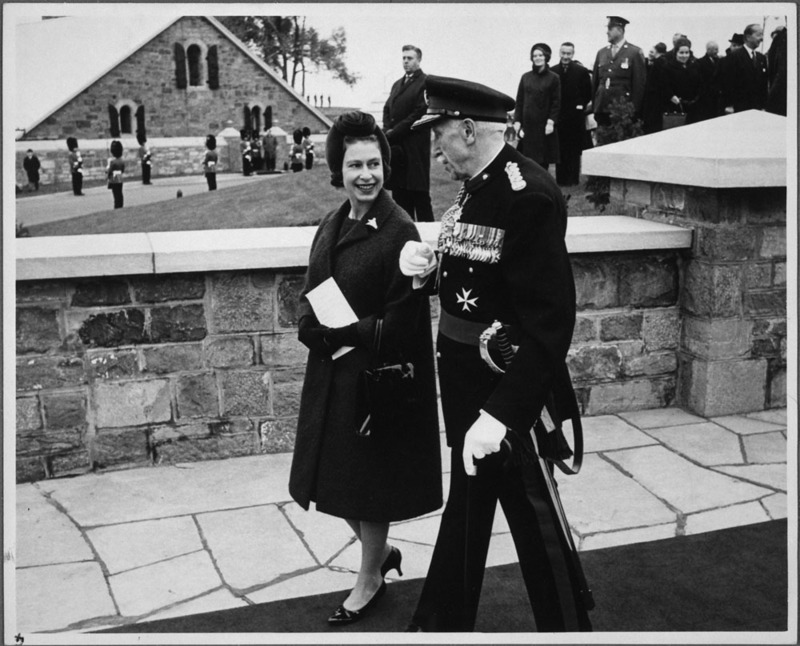 Queen Elizabeth II and Governor General Georges Vanier, at the Citadel in Quebec City, October 1964. Vanier’s years in office were turbulent ones because of a succession of minority governments, and the rise of violent separatism in Quebec (see Front-de-Liberation-du-Quebec). On St.Jean Baptiste Day in 1964, he was the target of separatist protesters in Montreal who called him a sellout and labelled him the Queen’s jester. Meanwhile, Vanier urged Canadians to love each other. After the inaugural Canadian Conference on the Family, held at Rideau Hall in 1964, the Vaniers founded the Vanier Institute of the Family — to study Canadian families and promote their spiritual and material well-being. In 1965, he created the Vanier Cup for the university football championship, as well as the Vanier Awards for Outstanding Young Canadians, awarded to deserving members of the Canadian Junior Chamber of Commerce. Vanier died in office, from heart failure, on 5 March 1967. Canadians sent more than 15,000 messages of sympathy to Rideau Hall. He was buried in the chapel of the Citadel in Quebec City, one of the governor general’s official residences.